Awesome story Cloudy. I've been reading your chronicles for awhile, but haven't posted. I believe that everything happens for a reason, and this was one of those times. Your story truly will touch anyone who has a heart, and I thank you for providing it for everyone to enjoy, and yes, I also believe that angels walk among us. 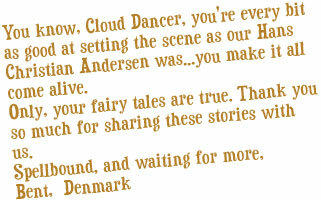 CloudDancer - Thanks for sharing your touching story. I hope by writing it down it's somehow healing. I'm figuring that **** and ***** were the owners you were referring to. ***** was very good friends with my grandmother and my grandmother babysat ***** as he was growing up. You may have even run into my ole man (*****) around then. CloudDancer: I read "Chains and Padlocks" at the end of the day yesterday before I left my office. It was not only beautifully written but brought tears to my eyes and I did not even know your friends. Have a great Thanksgiving and for one old goat who is not very religious, it was crammed down my throat as a kid, I thought your grace in another post was superb. All the best wishes and look forward to anything you write. CloudDancer, Yeah, I read your story shortly after you posted it (I check the CD chronicles pretty regularly) I don't think you have to worry about the readers not liking it. I thought about posting something to that effect when I read it, but honestly, I was a little choked up. It was a powerful story. I don't think you need to apologize for not being humorous ... some days life just isn't funny. Cloudy, I hope that this reply finds you free of the hangover that you probably had over the holiday. I offer my deepest sympathy for your loss. Even though it was many years ago, it obviously still lies close to the surface. November must be a difficult month for you. And then to have that chance encounter with the gentleman at the bar. Marley's Ghost... Dickens' characters were fictional, the visit from that spirit was very real. Please don't apologize to your readers for telling this tale. It has to be told - for many reasons. I started reading it at work - couldn't stop - and your story made my skin crawl when I realized where it was going. 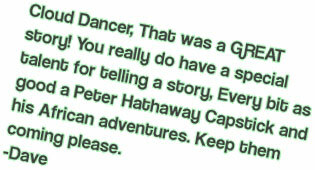 You have a rare talent for telling a story, my friend! I am sorry for you; it is terrible to have memories such as yours. I myself have lost friends to aircraft accidents, so I know the numb feeling. However, these accidents left something for the families to bury; helping them to let go. That is, without a doubt, the finest description of starting a radial engine that I've ever read. I can almost smell the burned oil. Thanks CD. CD, Don't you dare stop! I ran over two little old ladies gettin home to read your latest installment. Thanks. Woke up in the middle of the night unable to sleep. Go to supercub.org.......NOW I CAN'T SLEEP!!! Hey 'Cloud'... do continue please. I shared the story with a another writer/pilot friend of mine way up in Mi. Don't let anyone get you sidetracked; At the end of story 3 I found I didn't want to finish 'cause I knew the end was coming... even almost put off reading #4 till this morning but I couldn't wait. Waiting for another story-- down here in the swamps.